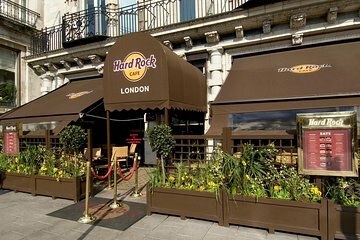 Book your table at the original Hard Rock Cafe in London and prepare to have a rocking good time! Built in 1971, this flagship restaurant continues to attract visitors from around the world, including the occasional musician. If you’re lucky, you may witness an impromptu music session. Upon arrival, you'll receive priority seating in the dining room or bar, where historic musical decor will lead you on a journey through the timeline of rock. Admire the rare items that adorn the walls, including Eric Clapton’s Lead II Fender guitar - the first piece donated to the establishment! Choose the 2-course Gold menu or the 3-course Diamond menu (sample menus listed below), then relax and enjoy friendly service, great music and hearty American fare. Afterwards, head to the cafe’s souvenir store and the Vault, London’s only rock n’ roll museum. Nestled in the old Coutts Banks, this site that once protected the Queen’s coffers, now safeguards the cafe’s most valuable items of memorabilia. Rock on! Yes, we did skip the line into the cafe, however it did not allow us to skip the waiting queue for a table. On the night we were there, we waited for over 45 minutes. Least enjoyable Hard Rock experience weve had. The food was truly mediocre and there wasnt really a line when we arrived, so we could have skpped the ticket entirely. Food was great, and it was fun to look around at the memorabilia. 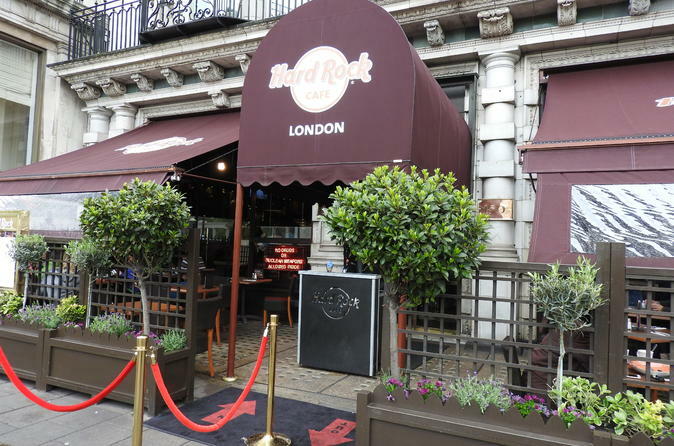 My expectations were very high, as this is the core café of Hard Rock's. It was terrific! The food was absolutely delicious, we had the golden menu with the Burger and brownie as desert.Attention was very kind, they took the extra mile to provide for an awsome experience for my little daughter 3 years as well. I recommend it, absolutely. Love the atmosphere! My friend and I enjoyed the meal very much. They are really delicious! One of the best veggie burgers I ever had! At the souvenir shop next door we had the chance to visit a small room for all the instruments/clothes from the famous bands/singers. Really recommended! Not priority as paid for. Had to wait in a crowded, uncomfortable place. Got a horrible table and service was not great, but the food was good. I would go again, but earlier than the 5:30 we went. The Legendary Hamburger earns its name. The Skip the Line option is nice, if you happen to be going at a time when it is crowded. We walked up around 1:00 on a Saturday and there was no line, so nothing to skip. The menu for the Skip the Line option is fixed. Only a certain number of entrees to pick from. That was not a problem for us, but might be for others. If you go, make sure you visit The Vault in the basement of the Hard Rock Store across the street. Tours are given regularly so check when you go in the store. Our guide, Ash, was a Hard Rock Enthusiast Extraordinaire'! We had a great time visiting with him.